The Japan tour was an amazing experience, and we were able to see so much during our short time here! Very pleased with our tour guide Keiko who was very friendly, pleasant and informative. She was very attentive to our needs and went out of her way to assist us. The flag was helpful but taller may be better. There were amazing sights and I was able to see many of the sights desired to see, even it was a short amount of time. Western hotels were very nice, good amenities, very pleasant staff. Ryokan who a wonderful experience - loved the presentation of meals and hot spring - staff who very pleasant. Broken air conditioning at Sheraton. Wonderful sampling of traditional cuisine but different each time. Tour guide Keiko was very friendly, pleasant and informative. She was very attentive to our needs and went out of her way to assist us. Amazing sights and was able to see many of the sights desired to see, even it was a short amount of time. 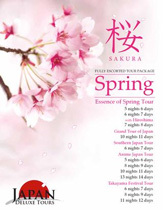 An amazing experience with Japan Deluxe Tours!